Pure Digital is the company that kick-started digital audio broadcasting (DAB) in the UK. Its Evoke-1S may be the best selling digital radio in the world, but the company hasn't rested on that success and recently produced two 'connected' radios for its new 'Flow' range. These new models pack internet radio, DAB, FM and the ability to stream music from your computer into one device. 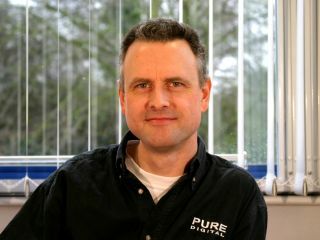 TechRadar caught up with Pure Digital's Marketing Director, Colin Crawford, this month to discuss the transition from DAB to internet radio, the continued criticisms of DAB (from both the tech community and audiophiles alike) and to find out a little more about what Pure Digital has in store for radio fans in 2009 and beyond. TechRadar: We're keen to know more about how you feel the transition from DAB to internet radio is happening right now. How do you see this evolving in the future? Colin Crawford: One of the reasons we waited so long before we brought what we call our 'connected radios' [the Evoke Flow and Avanti Flow] to market was because what we wanted to do was to really integrate broadcast radio and internet radio. We aren't really particularly interested in 'internet only' radios – radios which are only there for streaming – because we see that as a relatively niche [use] (and relatively niche for the foreseeable future). We still believe that the majority of people will listen to pretty much the same stations they do now. This belief is borne out by statistics that we've obtained from other technology providers and manufacturers, which show that the most popular stations for streaming are still the good old-fashioned broadcast stations. And, knowing that from a broadcast perspective it costs money to stream to individual users, our aim is to come up with a device that's a cracking broadcast radio (so, if I want to listen to Radio 2 or 3, Capital or Absolute I can do that on DAB or FM), but also one that lets me use internet connectivity in a number of ways on top of that. Firstly, for niche content, so my children who are big basketball fans are able to find American basketball stations. Also, my daughter loves heavy metal, so if there are no broadcast heavy metal stations, she'll find those [online]. Those are relatively niche requirements, if you like. We'll also use it for 'listen-again' content – so for me as a listener it's effectively a means of unchaining myself from the PC. I don't like to listen to radio on the PC: it's the wrong place, the wrong environment, the wrong time. I want to be able to listen to something I've missed on the BBC while I'm in the kitchen. I can now do that up to a week after broadcast on an Evoke Flow or an Avanti Flow. Perfect! There's podcasts as well, of course – but again, that's niche content. That's 'long-tail' listening stuff and this is all making up a small minority of overall listening time. So, we still believe that the majority of listening will still be happening on DAB for the foreseeable future. Why do you call it 'connected radio' and not 'internet radio'? This is the other big issue for us. We call it 'connected radio' because it's not just a one-way channel (or stream) that's been opened. It is potentially a two-way flow of information. That's the stuff [we're] working on right now – making use of that back channel to allow the customer to talk back and have a dialogue with the radio station in new ways.